Having talked about one major system change last week in the form of upkeep, let’s talk about another one this week: immigration. Ironically, it was almost exactly a year ago the last time we had a blog on immigration – my first blog post, in fact. Things have changed a lot since then – personally speaking, it’s amazing to think about how much the game has improved in a year’s time – and it’s about time for another look at how you gain characters over the course of the game. Currently (unless you’re on the experimental branch,) the immigration system is split into two parts. First was a simple trickle of a few random lower-class characters every two days, to help fill out work crews. The second was overseer immigration, which was based directly on the player’s “economic output” – a complex equation having to do with what players have created and how many times the item has been processed, etc. At this point, however, the economy is starting to come into its own in interesting ways. Decor, Quality of Life, and Upkeep all play off commodity costs and – ideally – mean players have to make decisions about what to spend their resources on day-to-day. If we were to integrate immigration directly into the economy, rather than a passive benefit, we could increase the complexity of player choice – and make for more interesting colonies. There’s another issue of note: housing has always, for better or worse, felt rather out-of-place. Players’ optimal path was generally to build a single huge bunkhouse and call it a day, since only beds mattered. While there are still elements of this to be resolved, bringing housing in as an element of immigration is a natural fit that also ties into the desire to bring immigration and economy together. Note this doesn’t mean you’ll always receive the maximum number of characters every time an immigration wave comes. Immigrants are fickle, and come where and when they will. 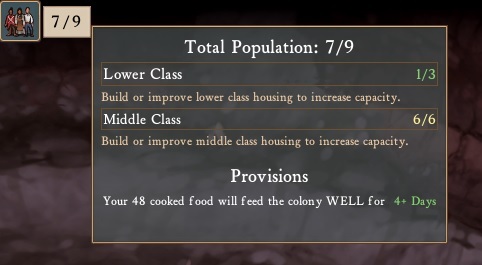 Rather, building houses increases your population cap, allowing you to fill your way up to maximum. Whether this averages slower or faster than the previous system will depend on your building habits. It’s worth noting we don’t consider this the completely final version of this system. Daniel and I have done a bit of talking and think it might be fun to tie modules in here as well, allowing certain modules to increase the capacity of a house further (that way you don’t necessarily need a colony with 70 houses in it.) This will not be in the first implementation, but I’m pretty excited to give it a try and see how it works out. As always, let us know what you think after you’ve checked it out! Yeah, I couldn’t unsee Rentahamster’s method. That’s exactly how I build the neighborhoods in my current game. Looks funky, but it saves so much space and so many resources. Having played the experimental for a while, it does give a nice suburban type sprawl to the game. This is SUPER awesome. I’ve always wanted a way to control more of my population.